It does not matter if you like to play your poker at home with friends or in the casino if you do not know the language of gambling you are going to have a rough night. We have put together a list of the most useful casino and poker terms and expressions and you can find them here. As new terms are always being invented we will try to keep this section up to date, so you do not look foolish next time you sit at the poker or casino table. Ace-High – A five-card hand that has no hand combinations (flush, straight, pair etc), but contains one Ace. All-in – When you bet all your money on a hand, either voluntarily in the belief that you have the strongest hand, or because do not have enough money to cover the full amount bet by someone else. You then contend for the pot in an amount proportional to what you contributed. Ante – The minimum bet that players must place into the pot by each player before betting begins. The ante is placed before any cards are dealt. Bad Beat – When a good hand that would have been expected to win the pot is beaten by a lucky draw. Big Pair – A Pair with a value of 10 or greater. Big Slick – An A-K combination as pocket (hole) cards. Blind Bet – A forced bet that is placed before any cards are dealt. It is considered a live bet for the first round of betting. You have big blind and small blind bets in the first round of betting. Bluff : A bet or raise with a hand that is unlikely to beat the other players. BOARD: (1) The board on which a waiting list is kept for players wanting seats in specific games. (2) Cards faceup on the table common to each of the hands. BOARDCARD: A community card in the center of the table, as in Holdem or Omaha. Bottom Pair : Pairing the lowest card on the board. BOXED CARD: A card that appears face up in the deck where all other cards are face down. Button : A player who is in the designated dealer position. See dealer button. Cold Call : To call a bet or multiple bets for the first time in a round. COMMON CARD: A card dealt faceup to be used by all players at the showdown in the games of stud poker whenever there are insufficient cards left in the deck to deal each player a card individually. Community Cards : The cards dealt faceup in the center of the table that can be used by all players to form their best hand in the games of hold”em and Omaha. Chase : To play a hand that is most likely worse than at least one other player. Check : To pass without betting. CUT-CARD: Another term for the bottom card. DEALER BUTTON: A flat disk that indicates the player who would be in the dealing position for that hand (if there were not a house dealer). Normally just called the button. DISCARD(S) : In a draw game, to throw cards out of your hand to make room for replacements, or the card(s) thrown away; the muck. DOWNCARDS: Cards that are dealt facedown in a stud game. (1) The poker form where players are given the opportunity to replace cards in the hand. In some places like California, the word draw is used referring to draw high, and draw low is called lowball. (3) The point in the deal where replacing is done is called the draw. Drawing Dead : Drawing to a hand that cannot win because someone already holds a hand that will beat what you are drawing to. Dominated : A hand that yields three or less outs which makes improving it very difficult. Early Position : A position in which you must act before most of the players during a round. Flop : The first three community cards dealt up at one time at a poker table. FIXED LIMIT: In limit poker, any betting structure in which the amount of the bet on each particular round is pre-set. FLOP: In holdem or Omaha, the three community cards that are turned simultaneously after the first round of betting is complete. FLUSH: A poker hand consisting of five cards of the same suit. FOLD: To throw a hand away and relinquish all interest in a pot. FOURTH STREET: The second upcard in seven-card stud or the first boardcard after the flop in holdem (also called the turn card). FULL BUY: A buy-in of at least the minimum requirement of chips needed for a particular game. All a player’s personal cards. The five cards determining the poker ranking. 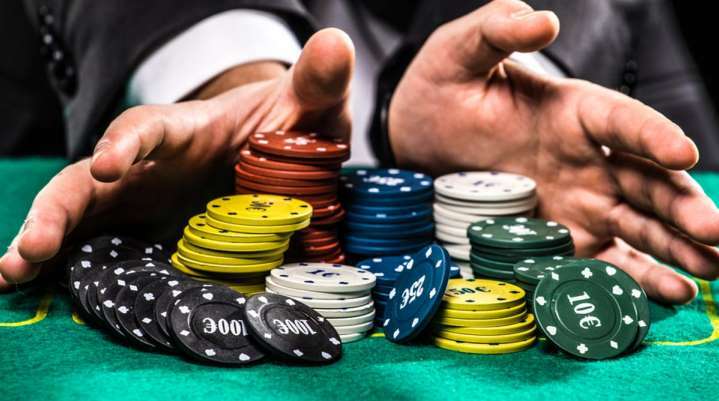 INSURANCE: A side agreement when someone is all in for a player in a pot to put up money that guarantees a payoff of a set amount in case the opponent wins the pot. JOKER: The joker is a “partially wild card” in high draw poker and ace-to-five lowball. In high, it is used for aces, straights, and flushes. In lowball, the joker is the lowest unmatched rank in a hand. Kicker: The highest unpaired card that helps determine the value of a five-card poker hand. KILL (OR KILL BLIND): An oversize blind, usually twice the size of the big blind and doubling the limit. Sometimes a “half-kill” increasing the blind and limits by fifty percent is used. A kill can be either voluntary or mandatory. The most common requirements of a mandatory kill are for winning two pots in a row at lowball and other games, or for scooping a pot in high-low split. Late Position: A position in which you act after most of the other players during a round. Loose: Playing more hands than normal. Loose Game: A game with a lot of players in most hands. LOWCARD: The lowest card facing up at seven-card stud, which is required to bet. Middle Pair: Pairing the second highest card on the board. Middle Position: A position in which you act somewhere between most of the other players during a round. The pile of discards gathered facedown in the center of the table by the dealer.